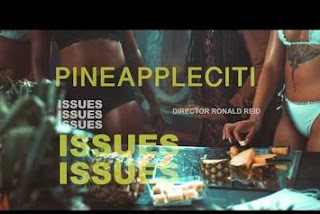 Home / Video music / Video :: PineappleCITI Returns WIth Visuals For "Issues"
Video :: PineappleCITI Returns WIth Visuals For "Issues"
Music :: PineappleCITI comes through with new video. Now, director Ronald Reid has breathed new life into the Swift Bangaz-produced cut with a new video that opens up with PineappleCITI seated on a throne while an assembly line of beautiful women cut up and transport pineapples. On the track, PC flexes an energy that easily establishes her as one of the more promising talents to emerge from the current surge of female emcees taking their place in the market. PineappleCITI’s own introduction can be credited to DJ Clinton Sparks who first discovered the upstart.